Tom has worked in golf for nearly 20 years and has been at Elk Valley since 2002. 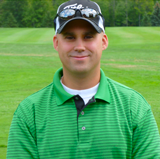 He began studying in the PGA under Dan Cantoni and has been teaching golf for over 12 years. Tom believes in teaching the basics, keeping the game simple and he enjoys working with all ages!